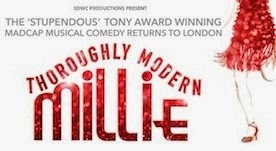 This marks the show’s triumphant return to London 11 years after it was first seen at the Shaftesbury Theatre in 2003.Thoroughly Modern Millie is a high-spirited romp that has all of New York dancing the Charleston. Taking place in New York City in 1922, It tells the story of young Millie Dillmount, who has just moved to the city in search of a new life for herself. It’s a New York full of intrigue and jazz - a time when women were entering the workforce and the rules of love and social behaviour were changing forever.